Fiji Water Co. fired back in a legal battle with the woman who became known as the Fiji water girl when she appeared in the background of numerous celebrity shots at the Golden Globes last month. The company responded to a lawsuit by Kelleth Cuthbert, whose real name is Kelly Steinbach, by countersuing in Los Angeles County Superior Court on Friday. The complaint alleges that Cuthbert breached her deal with the company and showed '"simple greed" by filing a lawsuit against Fiji Water. 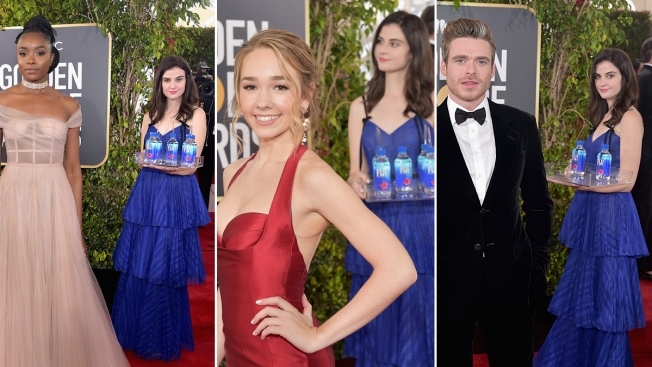 Cuthbert was on the red carpet at the Golden Globes on Jan. 6, passing out water and getting into the background of numerous celebrity pictures, leading to the Fiji water girl moniker on social media. Then last week, Cuthbert sued Fiji Water, claiming the company had no authorization to use the pictures from the awards ceremony in a massive marketing campaign.